Erik Stauffer is our parts manager and he has been in the industry for over 11 years. He maintains a large inventory of parts and accessories. You may just need a tune up, or some more options that can complete your ride. Erik has the knowledge and the parts to make your golf or utility vehicle the complete package. Contact Erik at (417) 883-9393. We have a knowledgeable parts staff with over 11 years in the industry. We offer a wide variety of parts and accessories that fit most makes and models. We sell parts for most off road vehicles. Our low prices and mechanical knowledge can not be matched. Call today to get the most out of your vehicle. 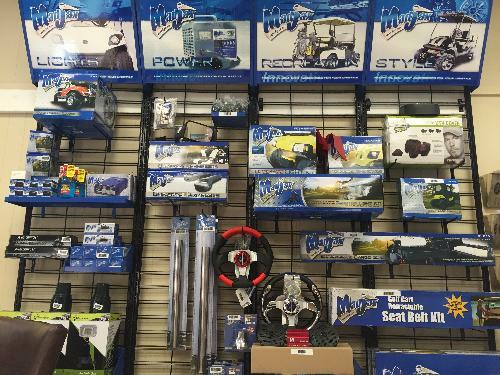 We offer a full line of accessories for many different makes and models. We have distributors located throughout the United States that can provide us with parts to make your vehicle the best fit for you.